Patristics Theology – new class! The Apostles Fast starts this evening and lasts until June 28. It is recommended that we observe strict abstinence on Mondays, Wednesdays, and Fridays. The Ruthenian Metropolia has identified this period as a penitential season (Canon 880, 2). This fast may be observed voluntarily. Here’s more detail on fasting. The ancient Healing Service is this Wednesday, June 22nd. Invite those who wish to be anointed and have hands laid on them. Have faith and expect a healing! Friday, June 24th is a solemn holy day for the Birth of John the Baptist. Vigil Divine Liturgy on Thursday, June 23rd, will be at 5:30 PM. 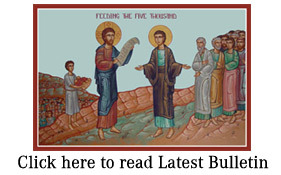 Divine Liturgy on Friday, the feast day, is 11 AM. Saturday, June 25th, is a work day at the parish. All hands on deck! Come and help with our various projects. Wednesday, June 29th is a holy day of obligation for the feast of Saints Peter & Paul. A new class has been added to our schedule – Patristic Theology. The initial class is Tuesday at 6 PM. Lawrence Township is having a 4th of July celebration and carnival from Saturday July 2 through July 4th at the Ft. Benjamin Harrison Finance Center. The finale will be a fireworks show that Mike Piland & crew choreographed. Ask Mike Piland for details about this family event. Thanks to those who helped with baking, wrapping & working the markets this week: Al Z, Alex, Mary, Richard M, Danny E, Carol L, Paul S & John D. The 2 weekend markets had $353 in sales despite the rainy Saturday morning – God is good. There will be more baked goods made on Wednesday. Come for a few hours to help us in our evangelizing effort and, at the same time, bringing needed income to our parish! More scrip cards came this week: clothing store, gas, grocery, pharmacy and restaurant cards. Anyone interested in becoming a St. Benedict Oblate please let Fr. know so an organization meeting can be scheduled. Also those who would like to be on a healing team please contact Father Sid.